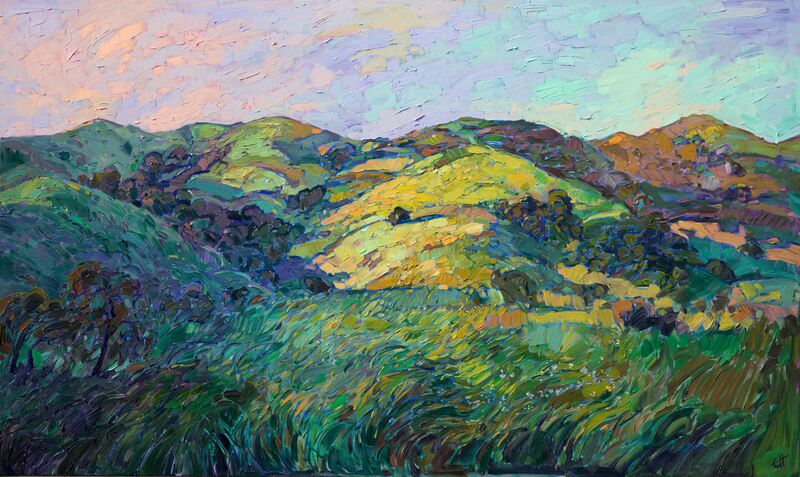 Vineyard of Color, by Erin Hanson, painted in the “Open-Impressionism” style by which the artist is so famously known, is for sale as part of Ms. Hanson’s Wine Country collection. The work showcases a slice of Paso Robles, a town in San Luis Obispo County, California. 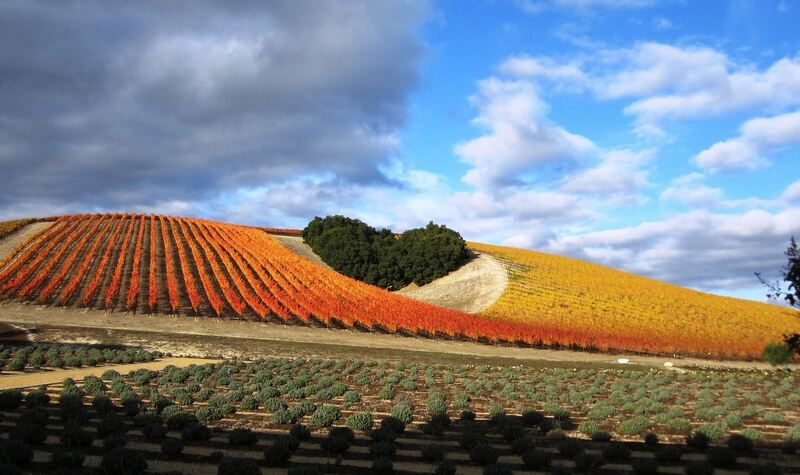 Paso Robles is famous for numerous wineries, historic hotels, hot springs, olive oil, and almond orchards. The region is a favorite spot for Ms. Hanson, who just completed a successful month-long “Art & Wine” show this past September, spanning 15 wineries throughout the Paso Robles Wine Country. Ms. Hanson has an extensive Paso Robles Wine Country Collection, although the contemporary impressionist paintings tend to be purchased quickly by her avid fan base. This painting was created on gallery-depth canvas and may be hung without being framed; the sides are painted as a continuation of the piece. 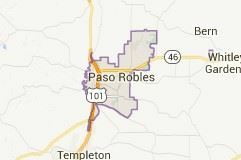 Paso Robles is shortened from the original name El Paso de Robles, which means 'The Pass of the Oaks.’ The California Mid-State Fair is hosted in Paso Robles annually at the end of July, in addition to many other events that occur year-round. For that reason, Paso Robles is a wonderful place to visit - for the stunning landscapes and for a variety of activities. Paso Robles Wine Country is a specific and very large area surrounding the city of Paso Robles. If you plan to visit the area, it may be helpful to know the difference between the two names and what they mean, to avoid any confusion. The quaint city of Paso Robles is rich with culture and history; an excellent place to refresh with a bite while traveling on the 101 freeway. A love of wine isn’t necessary to appreciate the historic downtown area, shops, and varied architecture. Better yet, plan to stay for a day and really experience what Paso Robles has to offer. We’ve included some suggestions below to help you enjoy a brief or long stay. If you love wine & food, Paso Robles is the place to linger a little longer for a one-of-a-kind visual and taste experience. Let’s start with the wineries, as they have really put the region on the map locally and internationally. For this reason, you’ll hear the Wine Country region also referred to as the “Paso Robles AVA,” which is much larger than just the city of Paso Robles. The Paso Robles AVA is a wonderful place to visit again and again, especially if you are fond of wines, of course. Approximately 26,000 acres of wine grapes feature the region’s heritage Zinfandel, as well as Bordeaux (Cabernet Sauvignon is a favorite), Viognier and Roussanne, among others. Vintner’s Villa, a 1,400 square foot French townhome, for a private retreat experience. Jim Gerakaris, CWE. Jim is a Winery Sommelier and Certified Wine Educator with an entertaining and relatable way of explaining wines and the winemaking process. 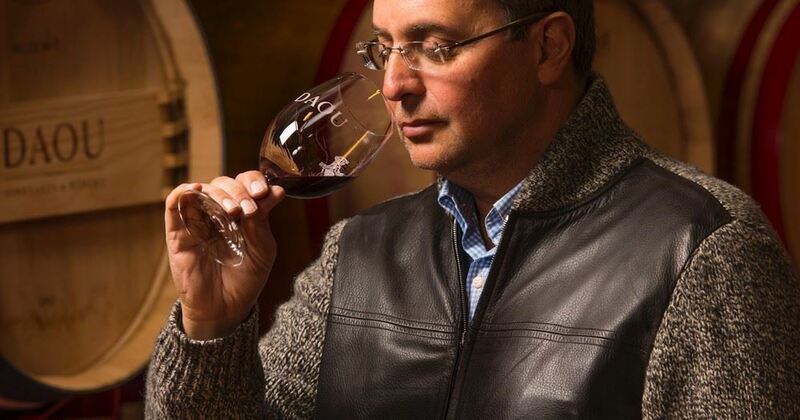 For Daniel and Georges Daou, the proprietors of Daou Vineyards, the very best Cabernet Sauvignon in the world is the end goal. The DAOU Spanish Colonial-style winery sits at 2,200 square feet amid 212 acres of emerald green vines and features a Club Membership with Wine & Food Pairings. Denner Winery is unique in design. Not only does the winery produce great wine, but the facility itself blends into the environment. Owner Ron Denner worked with architect John Robert Mitchell to design a winery that complements and fits into the rolling hills. Denner Winery literally “goes with the flow” because it is a gravity-flow winery. Gravity-flow helps to produce hand-made, artisanal wines and preserves the flavor inherent in the grapes with as little interference as possible. The member-oriented Denner maintains a Wine Club and the exclusive Comus House Bed & Breakfast. Reservations are requested, with deference to members’ needs over non-club members. A family-owned winery, Thacher Winery nurtures 52 acres of Zinfandel and petite syrah vineyards. Their Tasting Room is available Thursday - Monday, 11 am - 5 pm. 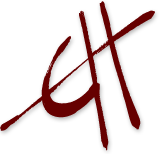 Thatcher also provides a Wine Club, and was one of the wineries that participated in the Erin Hanson Art & Wine Tour this past September, as mentioned earlier. 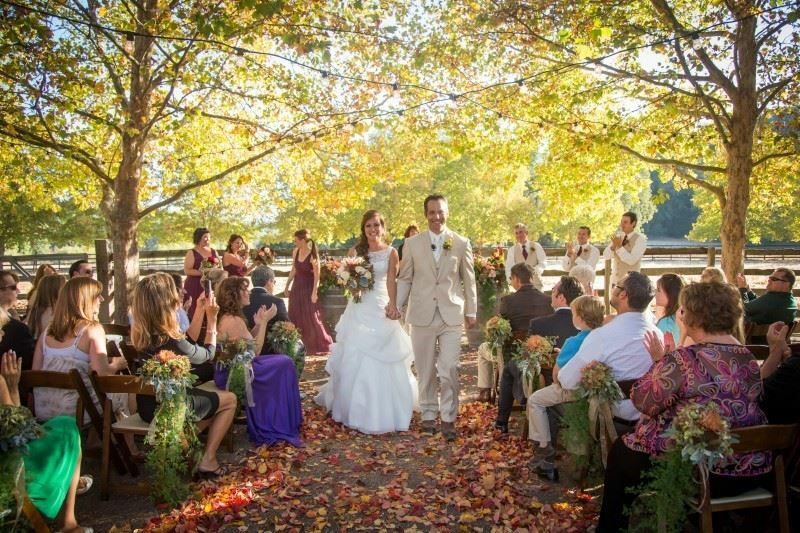 A cozy facility, intimate weddings, and parties are a specialty at Thatcher Winery. It’s the perfect spot for a small, classic Country-style wedding, replete with hay fields, vineyards & premium boutique production Zinfandel and Rhone wines. If you prefer a private wedding and exclusive use of a 52-acre ranch, with 1920's barn, winery, tasting room, and vineyard, this is the place! 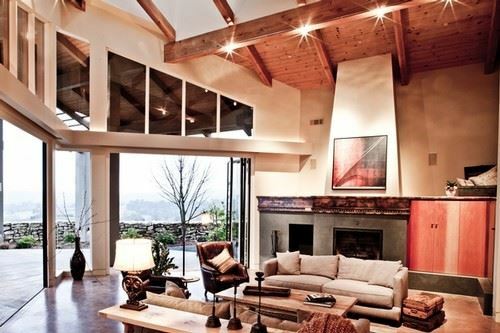 It’s loaded with old fashioned casual Californian charm. Note: The 2015 wedding calendar is currently full. Book 2016 soon! Contact the winery directly for more details. Niner Winery is a LEED Certified Winery on 212 acres across three different vineyards. Although it is known for Cabernet Sauvignon, Pinot Noir and Chardonnay, it does have a number of other varieties. As with most wineries, Niner has a Wine Club. Club 9 Members benefit from Niner’s small lot bottlings, most of which are allocated to the members. Drop by for Wine Tastings (daily from 10:00 am to 5:00 pm), then stay for lunch (Thursday - Sunday, 11:00 am - 4:00 pm). Love wine & food? So does Niner Winery! And they would like to share that passion with you. Visit Niner for their interactive winery tours, seasonally inspired lunch service and monthly chef-taught cooking classes and pop-up dinners. Winery Tours are available Friday - Sunday at 10:30 am and 2 pm and weekdays by appointment. Allegretto is more than a resort - it’s a philosophy. Thoughtfully designed for all types of guests, the Allegretto is a newer addition to the Paso Robles lineup of wonderful places to stay. Situated in the center of Paso Robles, it’s a perfect spot to get prepared to visit all the local sites. Wander through the European-styled resort, featuring 171 guestrooms and suites, private terrazas, custom bath amenities, and private pool cabanas. The Allegretto also features the contemporary landscape paintings of Erin Hanson, on permanent display throughout the hotel. A stunning backdrop for weddings or a sophisticated location for a business conference, it includes excellent dining options and a spa. Conveniently located in the heart of Paso Robles Wine Country, this Newly-remodeled Holiday Inn Express is a boutique-style hotel with everything you need, at an economical price. Business, pleasure or both, Holiday Inn gives you easy access to the nearby Paso Robles event center as well as downtown restaurants and shopping. 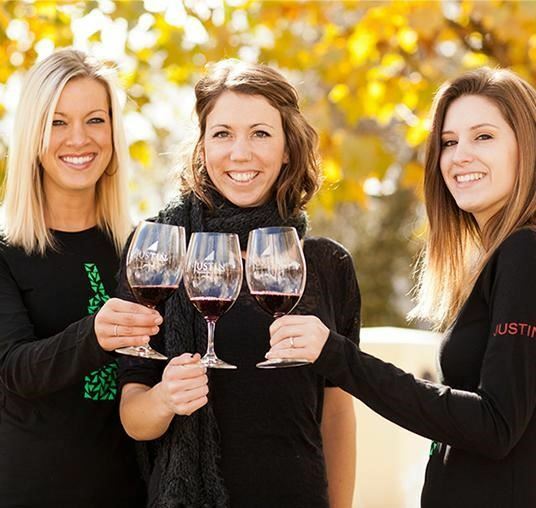 Be sure to check out their Paso Robles travel packages, which include wine tours, the Hearst Castle, Hunter Ranch Golf and the local waterpark. Hotel Cheval is a good choice if you’d prefer to stay in a boutique luxury hotel near the historic district of Paso Robles. The intimate 16-room luxury accommodations are just minutes from fine dining establishments, but if it’s a bar you’re looking for, you don’t have to travel far; The Pony Bar, a well-known traditional French-style bar, is on site. 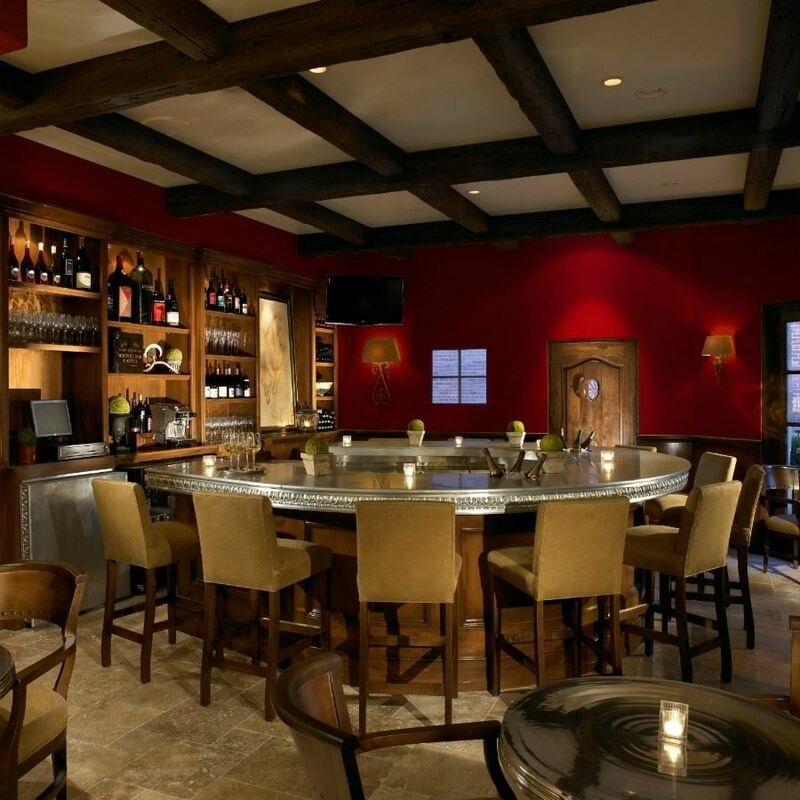 Pictured above is the zinc-topped, horseshoe-shaped bar, serving premium Central California wines, appetizers, and small plates. Hotel Cheval’s Wine Excursion Concierge & Certified Sommelier can help you prepare a custom Wine Tour or excursion, and the hotel also offers therapeutic spa services. Be sure to stop by Studios on the Park, a nonprofit art center in downtown Paso Robles. 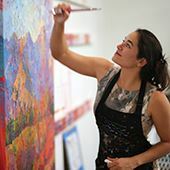 Twelve working artists, four studios and six galleries comprise a living and breathing art process best witnessed in person. Art classes and workshops are available to immerse yourself in the total Paso Robles experience: Great food, great wine, and great art. Contributions to Studios on the Park supports their mission to provide “a creative, educational, and transformational experience to enhance understanding and appreciation of the visual arts.” New events and exhibitions are always on the horizon, and Erin Hanson has returned to Studios on the Park again and again for solo exhibitions. Hop aboard for a custom tour to the wineries of your choice. 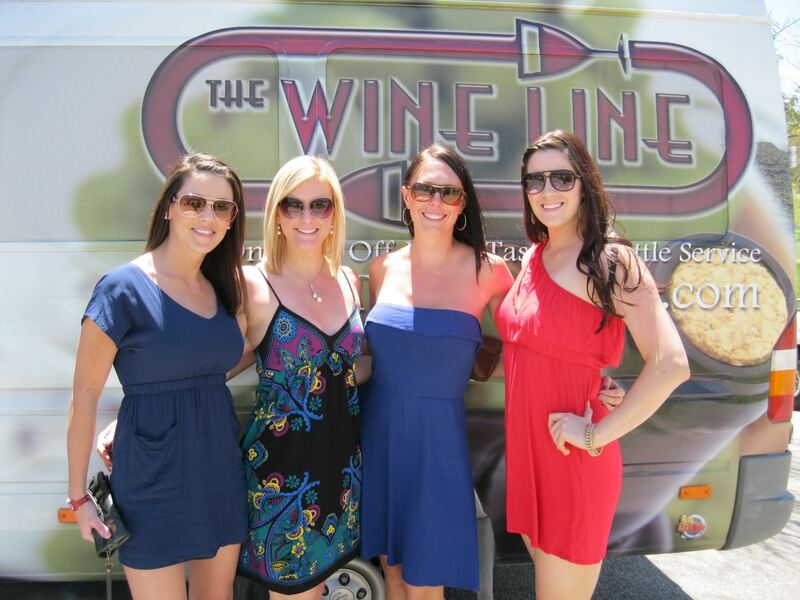 The Wine Line services over 60 wineries in the Paso Robles AVA, and provides guests with a free Wine Line Tasting Guide. Just to round out their services, The Wine Line website has a handy trip planning tool with all the information required to make decisions. 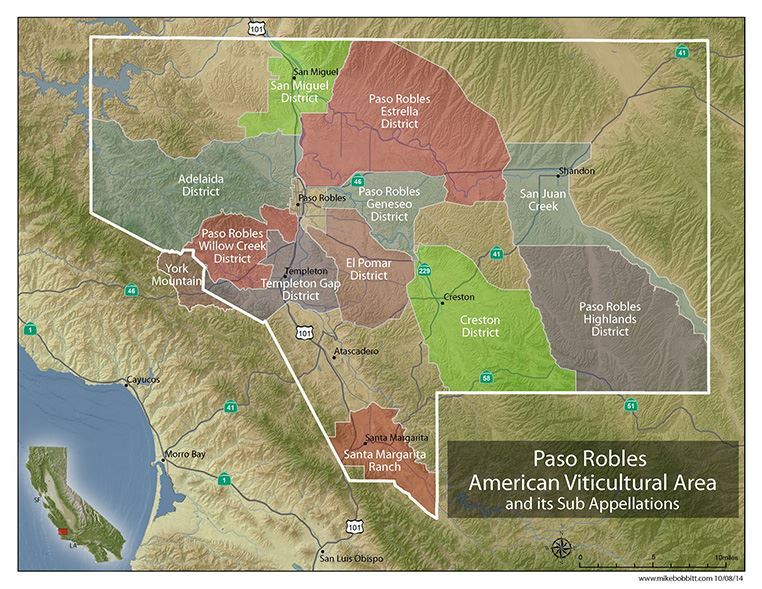 After all, the options are many in the Paso Robles AVA. The Paso Robles Pioneer Museum provides a well-organized and detailed collection of visual and cultural heritage. Enjoy a recently renovated clubhouse and beautifully conditioned, classic 18 hole course. A non-exclusive club, they are open to the public with reasonable fees and a fun but still challenging course. Afterward, refresh yourself at the bar or restaurant, serving breakfast, lunch, and dinner. Or just relax under the covered veranda. Golf lessons available. Bring your kilt. The Links Golf Course is an 18 hole Par 72 Championship course with a Scottish-style links layout. Featuring 5 par fives, 5 par threes and 8 par fours that is challenging (but fun) for all levels. Rudy Duran and Gary Wishon designed the beautifully manicured Bermuda fairways, which also include an all grass 300+ yard driving range, a chipping green, and a large putting green. Regardless of why you may visit Paso Robles, and regardless of where you stay while you’re in town, there is one thing you can count on: the food is phenomenal! Every cafe, hole in the wall and restaurant serves great tasting, high quality, farm-fresh food. People may come for the wine, but they’ll linger over the food. It’s worth visiting Paso Robles just to chow down on some really amazing, soul-satisfying, made-to-order deliciousness. And when the local Sommelier expertly pairs wine with your meal - it just doesn’t get any better. Enjoy your stay in Paso Robles, no matter the duration. Hopefully, the suggestions above can help you take advantage of everything the region has to offer.